This object in process is forming a biomimetic representation of the natural process of osteogenesis (bone formation and growth). 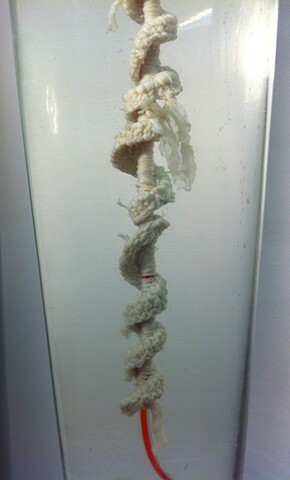 Hog gut is manipulated through knitting to create a hyperboloid tissue matrix. The matrix form was then suspended in a saturated solution of magnesium sulfate (Epsom salts) and disodium tetraborate (Borax) to grow crystals. This process, which takes a number of months, wants to mimic the natural biological process of the growth of hydroxyapatite crystals on a collagen tissue matrix in the development of living bone. The Hyperbolic Spine is a continuous spiral curve around a central cord, constructed to give better flexibility and tensile strength to the spinal column. It is a new body architecture that has the fantasy of being superior to the original human spine. This flexible structure is capable of bending in every direction with ease. Scientists have discovered through laboratory testing that it is possible to successfully implant sea coral in vivo and grow bone in the shape of the coral. Hyperbolic growth is extremely common in many types of sea coral, meaning that the Hyperbolic Spine is possibly a feasible design for living bone tissue. The hyperbolic spine is a design in process and hopes to someday be trademarked as "the spine of the future".